Asif Khan is most well-known for his remarkable performance in one-man monologue quartet Love, Bombs and Apples, and his debut outing as a playwright is similarly impressive, bringing clarity and humour to dark and difficult material. In Combustion, Bradford garage mechanic Shaz tries to hold onto his business, and family, in difficult times: the English Defence League are marching through the city because Asian men have been caught grooming young girls. 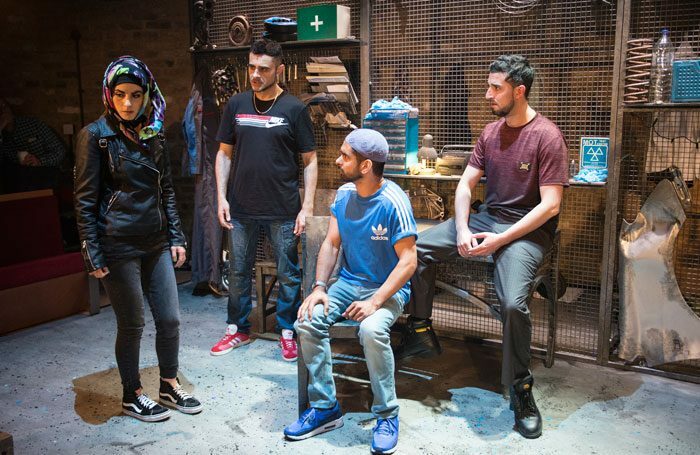 Cutting to the heart of cyclical violence that crosses racial and religious divides, the play focuses on a variety of responses within the Islamic community. Beruce Khan is convincing as the devout moderate who wants to keep his head down, and it is difficult to watch these instincts lead to angry, controlling behaviour towards his sister Samina (Shireen Farkhoy), who wants to campaign for peace within the community. Meanwhile slow-witted mechanic (Mitesh Soni) wonders whether he might be safer in Pakistan, and his friend Ali (Rez Kempton) wants revenge on the Islamophobes. Designer Mila Sanders lends an oily, workman-like air to the characterful and light Tara Theatre space, and the garage and cleverly used furniture pieces also incorporate echoes of geometric patterns from Islamic art. Nona Shepphard’s direction includes unnecessarily fussy tableaux at the top and tail of scenes, but within them she extracts strong performances which tread a good balance between multiculturalist sitcom and meaty debate. The play ends a touch sunnily, given dark revelations in the second half, but this is a deft and powerful debut drama.